( human condition in contemporary art) on October, 5 up to January, 27, 2013. Hard stuff for untrained palates, the issue is, though, dramatically human. Few notes of Bacon’s life get here a necessary clue about his paintings. Born in 1909, Bacon dies in 1992. As a child, the tense relationship with his father, too fond of military discipline, his early recognized homosexuality and the family constant moving between England and IRA ravaged Ireland, contributes to shape him into an outsider. After an independent London approach floundering among odd jobs at 16, Bacon experiences the Weimar Berlin of the twenties, the Bauhaus design and the burgeoning cinema of Fritz Lang and Sergej Eisenstein. Their respective masterworks Metropolis and the Battleship Potemkin will leave deep marks in his artistic background. Next destination, Paris, where he is highly impressed by the cubist paintings of Picasso and by his lack of any formal artistic training. Under the influence of Picasso’s production of the twenties, Bacon paints in 1944” Three studies for figures at the base of a crucifixion” a triptych able to bewilder the onlookers because of the limbless biomorphic creatures, hardly resembling human forms. Elongated necks, toothed mouths open as if screaming, protruding ears from a jaw appear as anguished details of a thwart human condition, the very core of Bacon’s creative process, difficult to put up with. The painter has always been moved and charmed by pictures featuring slaughterhouses. Crucifixion, beyond its alleged religious meaning, is –in his own words- just an act of man’s behaviour, a way of behaviour to another. He ordinarily uses to collect photographs of animals, taken just before being killed when they seem to be aware of their oncoming martyrdom and their effortless attempt to escape. 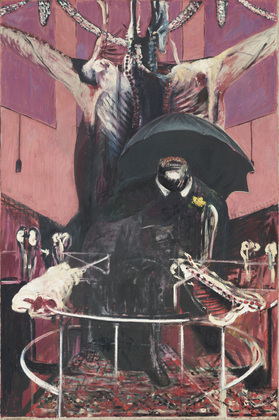 Bacon later approaches art more figuratively in ”Painting of 1946”, an immediately recognized masterwork, bought in 1948 by Alfred J. Barr for the New York Museum of Contemporary Art. Painted in the World War II aftermath, it features an impressively brutal, anonymous public figure in a formal suit, reminding of the uniforms of British politicians of the period. His face and grimace have lost any sense of human, enhanced by the cruciformed cow carcass behind the character. A homage to great masters like Rembrandt or Soutine and to his childhood’s fascination for butcher’ s shops as well. About the genesis of the work Bacon, quite interestingly, in an interview with David Sylvester says: ”it came to me as an accident I was attempting to make a bird alighting on a field .. the line that I had drawn suggested something totally different. I had no intention to do this picture. It was like one continuous accident mounting on top of another”. 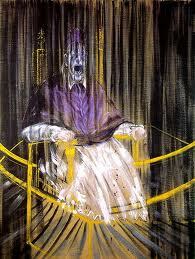 In spite of his declared standing aloof from religious items, in 1953 he painted ”A study after Velasquez’s portrait of Pope Innocent X”, featuring a screaming Pope on a golden throne with blurring vertical lines, further focusing his obsessive interest for both screaming or crying mouths. To a deeper comprehension of his paintings Bacon adds” scream is a horrific image; in fact, I wanted to paint the scream more than the horror. I think if I had really thought about what causes somebody to scream it would have made the scream that I tried to paint more successful…. I’ve always been very moved by movements of the mouth and the shape of the mouth and teeth… I’ve always hoped in a sense to be able to paint the mouth like Monet painted a sunset.” Clearly he states ‘Painting is the pattern of one’s own nervous system being projected on the canvas’. The idea is not new, it is in a way linked to the automatism of Surrealism which is actually part of his artistic background. Bacon has courageously faced life in its physical terms of monstrously twisted bodies, marked by corruption and death. His dehumanized creatures in their helplessness and hopelessness become expressions of the uneasiness and tragedy of an age heavily marked by war, massacres and starvation. Nathalie Djurberg, Adrian Ghenie, Arcangelo Sassolino, Chiharu Shiota, Annegret Soltau who have shared with him the anguished uneasiness both individual and collective of the past century and the beginning of the present one. If you are going to spend few days in Florence profit from the accommodations offered in the area by Tuscany Holiday Rent. Questa voce è stata pubblicata in Art and accommodations, Senza categoria e contrassegnata con a study after Velasquez's portrait of Pope Innocenzo X, Adrian Ghenie, Annegret Soltau, Arcangelo Sassolino, automatism of surrealism, Chiharu Shiota, David Sylvester, Francis Bacon at the Strozzina, Francis Bacon e la condizione esistenziale nell'arte contemporanea, Franziska Nori, interviews with Francis Bacon, Nathalie Djurberg, Painting of 1946, Picasso, three studies for figures at the base of crucifixion. Contrassegna il permalink.